Whether you're a habitual tidier who does a few chores every day, or you prefer to crank up the tunes and give your place a good scrubbing every few weeks, having a few tricks in your cleaning arsenal makes the whole process go so much smoother. The next time your home is in disarray, turn to these projects to give it the sheen it needs. From restoring floors and windows to purifying shower heads and mattresses — how often do you remember to do that? — this list covers everything from well-trafficked areas to often-overlooked essentials. Your house will be shining like a diamond by the time you're done with it. Ok, so you wash your bedding regularly, but how often do you clean your mattress? We spend a hefty portion of our lives in bed, so making sure it's clean and deodorized is crucial. 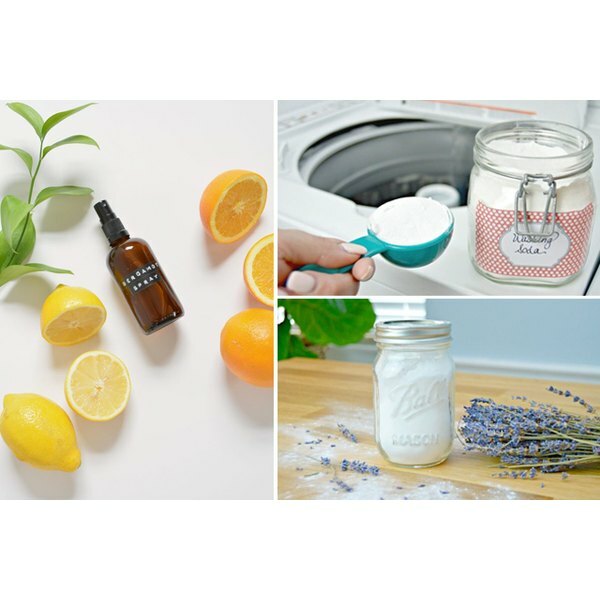 A combination of baking soda and lavender oil is all you need to make sure the place you lay your head at the end of the day is fresh and inviting. Don't stop at the duvet and mattress. Show those pillows some love, too. Did you know you're supposed to wash them every 3 months? It helps get rid of things like dust mites, body oils and dead skin cells (yuck!). Just toss those babies in the washing machine and they'll be cleaned and ready for bed whenever you are. Oh, no: if your oven smokes whenever you turn it on because there's grease stuck on the inside, then it's time for a good scrub. Store-bought cleaners are typically full of harsh chemicals and an even harsher smell that'll have you airing out your kitchen for hours afterward. This all-natural option is the perfect non-toxic solution. Your shower head helps keep you clean, so you should return the favor. Fill a zip lock bag with distilled white vinegar and use a rubber band to attach it to the shower head. Let it sit for 30 minutes while you work on finally folding that load of laundry that's been staring at you for days. The Washing Machine Cleans Your Clothes, But Who Cleans the Machine? Just because your washing machine fills with hot, soapy water to wash out last night's clumsy guacamole stain doesn't mean it's a self-cleaning appliance. Give the inside a once-over with vinegar and warm water every few months to eradicate any mildew that may be lurking in your washer's dark crevices. It makes sense that the thing you throw your garbage in would be extra smelly. Stomp out the stench with a good wipe down and a sprinkle of baking soda directly in the bottom of the can. Periodically add a bit more baking soda to the bag whenever you toss something especially stinky in, too — it'll help neutralize the odor until trash day. Keep your windows and mirrors shiny and streak-free with a simple glass cleaner. Combine vinegar, water and dish soap in a spray bottle and you're good to go. Use a small Squeegee to remove the cleaner and any leftover dirt, and you'll have windows so clear you'll think they're not there at all. Cleaning the floors should be one of the last things you do, because this gives you an excuse to finally sit down while they dry. Spray the baking soda, peroxide and vinegar solution directly on your mop to remove dirt. Add a few drops of your favorite essential oils to leave a lovely, all-natural scent behind when you're done. Like the bow on top of a shiny package, this easy-to-make room spray is the perfect finishing touch to a clean space. Use different combinations of your favorite essential oils to make a unique scent, or whip up a couple of classics that you can turn to daily. You tackled the inside of your house, now it's time to move outside. Keep as much dirt as you can outdoors by placing a doormat at your entryway. This pineapple doormat is not only festive and adorable, it's also a cinch to make. A simple template and a few bottles of craft paint are all you need to take your plain rug from dull to delightful. Get your grill back to shiny perfection after a busy summer by giving those grates a proper scrubbing. You'll need a paste made from baking soda and water and a bit of elbow grease to get the job done, but your next batch of burgers will thank you for it.